Man Behind Lens: Photojournalist Attacked @ KL Rally! 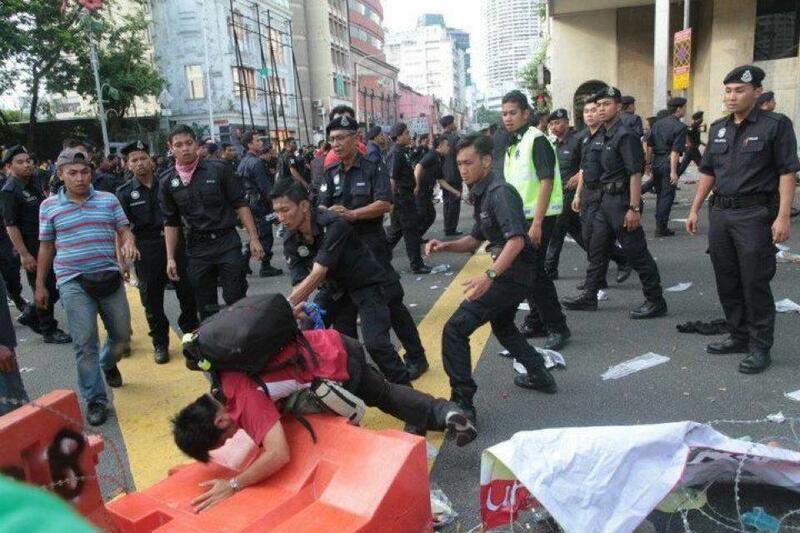 Photojournalist Attacked @ KL Rally! It is NOT SAFE being a photojournalist and it is getting worst! I Google "photojournalist attacked" and got 2,840,000 results! The appalling picture above showed the photographer from Guang Ming Daily in Kuala Lumpur being knocked to the ground by Malaysian police! I was told the photographer was covering the much publicised Bersih 3.0 protest in Kuala Lumpur on Saturday (April 28, 2012). I Google Bersih 3.0 and got a 30,000,000 result!! My Malaysian contacts informed me that there were more than seven incident of journalists being attacked by the authority! According to Guang Ming, their photographer Huang Anjian, left; was arrested for no reason by the police. He claimed one of the angry police officers punched him on his forehead a few time. Huang has made a police report. Of the hundreds of video submitted to You Tube on the Rally, this one by Lumier Asia was done extremely well! Take a look! Good on you for showing this !